Major figures in the history of video art and electronic media, the Vasulkas have contributed enormously to the evolution of digital aesthetics through a prolific body of work exploring the malleability of vision, the manipulation of electronic energy and the interrelation of sound and image. This programme will highlight single-channel video works created in the 1970s in conjunction with a presentation by the artists about their current work. The Vasulkas' investigations into analogue and digital processes and their development of electronic imaging tools, which began in the early 1970s, place them among the primary architects of an electronic vocabulary for image-making. All of their work is in some way connected to a fundamental agenda: to interrogate the intrinsic properties of the machine as cultural code and the latent or overt perceptual changes that emerge. Please note that this programme is not suitable for people sensitive to flashing images. 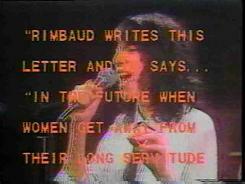 Tuesday, February 23, 2010, 7:30 p.m.
- Sarabande (2008, 15 mins, PFA Collection). - Compline (2009, 18.5 mins, From the artist). - Aubade (2010, 11.5 mins, From the artist). Oporto apresenta #18: What is the sound of one hand clapping? Liliam Lijne could be considered as a "kinetic wizard" for her persistent research on the fluid matters of time and space. 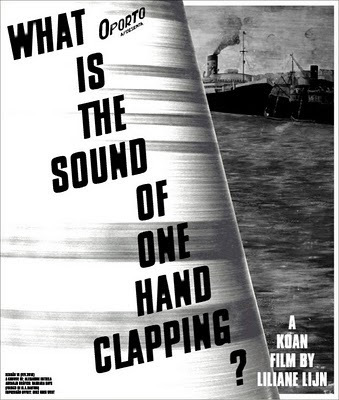 The film "What is the sound of one hand clapping?" is a natural follow up for her kinetic experiments done during the sixties. The piece is based on the phonetic resemblance between the words "Koan" and "Cone" and could be seen as a "conic mantra". Several early sculptures, preliminary studies for her monumental work "The white Koan", were portrayed spinning. The rotating movement liberates inner resonances that were captured by the camera as ontological matter. Thursday, February 11th, 2010, at 6pm. Witold Krymarys (b. 1948) has been active in the artistic field since 1972. In the 1980s he took interest in structural video and started to penetrate fields bordering on photography and video. He created the series "Fotomocje" ("Photomotions"). These were blurred photos taken at lower shutter speed, which deprived the image from the resemblance to reality up to the point of being illegible. As the author claims, that point or border was crucial to him. 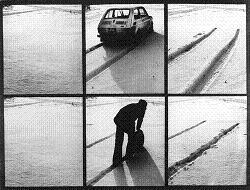 The photographic series found its conclusion at the exhibition "E-MOTION" at the Gallery of Lódz Photographic Association in 1978, and inspired the following video works. By the 1990s, Krymarys recorded a couple of dozens of short films, often documentaries based on the themes from local artistic life. San Francisco film and video maker George Kuchar is one of the most interesting and prolific (over 200 works) media makers working today. With his homemade Super-8 and 16mm potboilers and melodramas of the 1950s, ’60s, and ’70s, he became legendary as one of the most distinctive and outrageous American underground filmmakers. In the 1980s he transitioned to video, making dozens of subversive, witty, often diaristic works employing friends, students (at the San Francisco Art Institute), and whatever might be creatively (“no-budget”) at hand. Tonight’s sampling of recent works includes, along with other surprises, The Hairy Horror (2009), a short meditation on a tall terror in the trees that shade shadowy giants from the glare of sanity; Burrito Bay (2009), a video diary about the making of another of his films, Tropical Vulture, which “blends Hollywood glamour and drama with an all-too-real-life approach”; Portrait Of Genie (2008)—"An ex-student of mine opens up in the privacy of her home and shows me her etchings (watercolors) as we talk of art and things that slip under the fabric of daily attire"; and X Mass (2008)—“A California winter turns the left coast into a brew of foaming festivities while landlubbers leap for joy in the spray of salty slurping.” "[Kuchar’s films] were my first inspiration…the pivotal films of my youth, bigger influences than Warhol, Kenneth Anger, even THE WIZARD OF OZ. "—John Waters. Co-presented by QDoc: Portland Queer Documentary Film Festival. Kuchar also visits the School of Film for conversations with filmmakers. Dan Graham’s artistic practice has been influenced by music from early on and this interest becomes more explicit in the late 1960s through some of his first writings such as Live Kinks, 1969 a review of a concert by the Kinks. During the 70s and 80s, Graham developed close working relationships with composer Glenn Branca and musician and Sonic Youth founder Kim Gordon, who supposedly started her music career by taking part in one of Graham’s performance pieces, which didn’t quite go according to plan and turned into a fully fledged concert. Through “a shift towards the documentary” as described by LA MOCA’s Bennett Simpson who recently curated a Graham retrospective, the 1980s saw the release of two video works by the artist which explicitly deal with the subject of popular music: Minor Threat from 1983 on a concert of the American punk band of the same name and the more complex Rock My Religion (1982-84), developed in discussions with Branca, Gordon and Sonic Youth’s Thurston Moore, all of whom contributing to the soundtrack of the work. Discussion with filmmakers Donna Cameron, Jonas Mekas (founder of Anthology Film Archives and founding member of The Filmmakers' Coop), and film critic-programmer Cullen Gallagher. This event is part of a monthly screening series with The Film-Makers’ Cooperative, and focuses on the legacy of American filmmaker Shirley Clarke, thirteen years after her death. 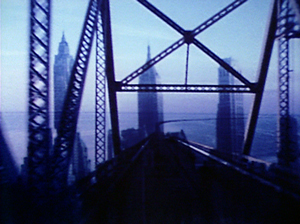 American filmmaker Shirley Clarke, with whom Cameron worked one-on one from 1987-1990 on their collage portrait work Shirley Clarke in Our Time, created this masterpiece of experimental dance film using Manhattan’s Bridges. In this film Manhattan Island becomes a maypole around which its bridges, detached from moorings, execute a bewitched and beguiling dance. The filmmaker has magically set them dancing to two different music tracks- an electronic score by the Barrons and a jazz score by Teo Macero. Each track affects the viewer’s response to the imagery of the film differently. Five American masters all explore dailiness, film as a stage for performance, and most importantly the possibilities of using music with equal importance to image in tonight’s screening.